As most of y'all know, I am on Long Island for a physical therapy internship. I will be here for 8 weeks and will not be doing any cakes while I'm here. As I was thinking about what to put on the blog I realized that I should focus on the OPTIMIST part instead of just the CAKE part. Yes.. this is going to include more about feelings and less about frosting technique, but I hope you enjoy it. Here is an overview of my first week on LI. Like most people in the country, I have been thinking a lot about the 10th anniversary of 9/11. This day shaped my high school years and changed the way I thought about my country. I knew that it was a terrible thing to go through for the victims and their families, but I didn't give it that much thought. I am now working in a PT clinic and it is a wonderful experience. I get to work alongside the physical therapists and interact with a wide variety of New Yorkers as they heal from various injuries and surgeries. We had one patient in the clinic this week, lets call him Gary, who touched my heart. He is a NYC firefighter and was one of the first responders to the attack on the Twin Towers. I remember the news broadcasts and the tributes dedicated to the brave firefighters of NYC. They were the ones who ran up the dozens of flights of stairs to pull people out before the towers collapsed. They were the ones who sorted through rubble to find survivors. They were the ones who gave their lives to save the lives of others. I have felt gratitude for them but I have never looked one of these men in the eye. I assure you, it is a humbling experience. Gary told us how he is on medication for post traumatic stress disorder resulting from the events of his 9/11 experience. I wondered about the stories of all the other men and women who were effected and changed by 9/11. Where are they now, who is helping them and taking care of them in 9/11's wake, and do they feel the gratitude and respect that I have for them? For Gary, his job and life of service did not end on 9/12. He returned to work and two years ago he was hit in the neck by falling wood while he was pulling a lady out of a house fire. He saved her life, but is in constant pain from his injury. He has been "let go" from the fire department because of his health problems and has since been on anti-depressants and anti-anxiety medications. He expressed that being a firefighter was his true love and passion and it has been very hard for him to cope with this change in his life. Gary is a man's man. He is Italian, salt and pepper haired, broad shouldered, and Catholic through and through. He is not the type of man that you could imagine sitting on a couch and living off of disability. He is the type of man who would run into the fire to save others, even if he was not a trained firefighter. I could hardly get through his exam without crying. I just felt so sorry for the events that have led to this injury. I felt pain at seeing Gary's depression and I wish there was a way to let him know that he still has worth and purpose, even if he is not saving someone's physical life. I hope that Gary knows that he is still someone to look up to and admire for all he has done for others. Another one of our patients this week, lets call him Lee, really stood out to me. He used to be a NBA referee and he is having lots of neck pain. He is a funny and lighthearted man. When I told him that I am planning a trip to Coney Island, he talked forever about going there on dates as a boy and taking his granddaughters there now. As he was leaving the clinic, the PT I'm working with said that she would be thinking about him this weekend. She later told me that Lee's son died in the Twin Towers. He worked there, on one of the higher floors and didn't escape before they fell. Lee said that him and his wife are holding a memorial for their son and he thanked us for our support. He was somber, but still had a twinkle in his eye. I was impressed by his joy for life, despite having lost a loved one in such a terrible and unfair way. On Saturday I decided to go into THE CITY, as cool people call it, and see what I could see. The NY Philharmonic was giving a free concert which you could watch outside at the Lincoln Center, or get tickets too if you stood in line. I went the line route and had a great experience. I got in line at 1:45 pm for the distribution at 4 pm. While we were waiting, the people around me told their stories about 9/11 and we were asked to write about how music helped us through the experience. I felt like I was intruding. I was effected by 9/11, but not like those who were living in NYC. Their experiences were hands on and real, while mine were distant and vicarious. The concert was at 7:30 and before anything else, we were led in an amazing rendition of the Star Spangled Banner. Between the full orchestra, the choir, and us, the sound was overwhelming. I don't think there was a dry eye in the place. The conductor, Alan Gilbert, gave an incredible speech and introduced the piece they were playing, Mahler's Symphony No. 2 (also called Resurrection). The various movements of the piece show how life is full of destruction, but if we trust in God, we will be made whole again. It was amazing how strong the spirit of love and gratitude was in that room. The conductor mentioned how art may seem unnecessary in times of destruction, but it is art which helps us to feel and overcome grief. This has been true in my own life. (I don't know what I would do without Journey's "I'll Be Alright Without You" in times of heart ache.) I only hope that the people effected by 9/11 also feel the support and cathartic healing that the music brought. So ten years later, I am feeling the effects of 9/11 more strongly than I ever have in my life. I feel like I understand more about the pain and sacrifice involved. I also, however, feel more than ever, the peace and joy that awaits us in the future. I am grateful for this wonderful country and it stands for. I am grateful for th men and women like Gary who give their all to help others. Ashley you have a true gift of words that brought tears to my eyes and love to my heart for the heroes of New York. 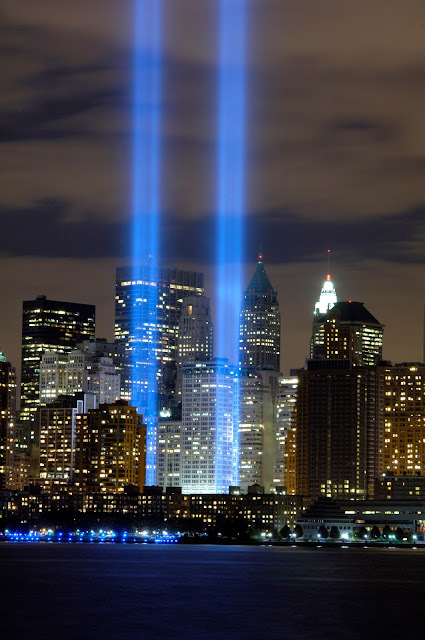 Thank you for bringing to light the moments of your life in reflecting the tragic of 9/11.